Ask for help. It’s OK to not be able to do it ALL by yourself. Acknowledge where you need assistance and then go and find it. Whether that’s finding a personal trainer, watching YouTube videos of ‘how to’ tips or chatting to a friend who is a regular gym or class go-er. There are so many resources available to you, at of which are free of charge. Seek help where you need it. Start somewhere. It doesn’t matter where you start, but just start! Don’t put it off until next week, don’t say to yourself you need to get fit first…just start! It’s the hardest, most intimidating part…but its achievable no matter how small that start is. Go for a walk, do some stretches, dance around your kitchen, arrange a game of tennis with a pal – whatever it is get yourself going and you won’t regret it! Make a plan.Planning time to be active, organising what to eat, getting up earlier in the morning all takes planning and a lot of it! Making activity a priority is a step in the right direction. Know on Sunday when your activity/training is going to be for the week ahead and actually block it out in your calendar. Even better try and fit them around the same time each week so that it just becomes part of your routine. And, look, if you have to miss a session.. don’t kill yourself about it..just get back on track for the next week. 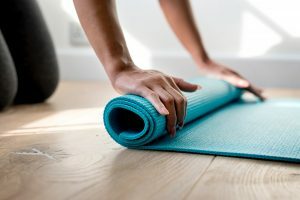 Try and make exercise as convenient as possible (such as finding a gym that is on your commute or booking a class that fits in perfectly to your lunch hour) around your other commitments so there is less room for excuses. Be realistic. Small wins = big gains. Don’t set yourself up to fail by creating unrealistic goals. Start off small and tick off in your diary when you have completed your tasks. Charting your progress is incredibly important to see progression. All or nothing is not a great way to go and going too hard too soon can causes injuries or muscle soreness so bad that you can’t walk let alone workout for a week! Find something fun to do. Most the time it’s not what you do, it’s how consistent you are with it. If it’s not fun, you simply won’t want to do it! You have stopped before you have even started! Yes, potentially there are ‘more’ efficient ways to achieve goals (doing resistance work, compound movements etc) but if you love ten pin bowling and you are going to go bowling 3 times a week and that’s more movement than you’re used to…stick to ten pin bowling for now! Praise is good! Don’t forget to say WELL DONE to yourself as you go. Acknowledge all the small wins you are having each week and keep encouraging yourself. Taking the first step of bothering to read this post is a good start so well done you!